This project is based in Lahore on the famous Bedian Road which is popular for its lavish farmhouses. It is an immensely popular market for many famous Architects in Lahore who have had the opportunity to display their remarkable skills through some well respected clients. 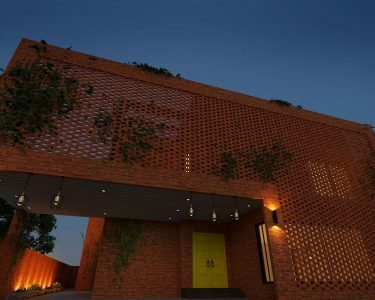 Our client Farhan Lashari, a photographer by profession, wished to have his one kanal house designed on traditional lines using the most conventional material used extensively in Pakistan; brick. Brick has its unique qualities which make it a staple construction material in the sub-continent. It is cheap, as well as highly durable. When used in its organic form, without plaster or paint, it gives a genuine traditionally rooted aesthetics to a building. 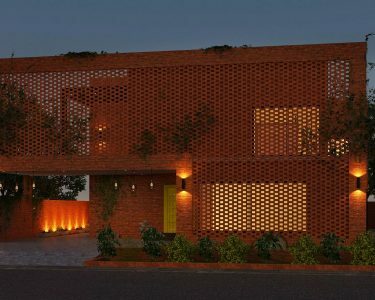 This house is built in stretcher brick bond and the front facade consists of a vast covering of brick lattice. This lattice gives the essence of a traditional “Mughal Jali” which is a significant element of the Indian sub-continent’s historic architecture. The way a jali brings in filtered sunlight in the day, this lattice plays its part in giving the space a subtle experience of light and shadow. This little play of light transforms the space from sunrise to sunset, giving the dweller an overwhelming experience which is unique from any other four walled room with windows. Such spatial experiences tend to give the mind and soul a spiritual calm. This conventional building design incorporates some faint traces of vegetation which give the facade an organic aesthethic. Arbitrary scatter of creepers and hanging bushes produce an interesting contrast with the red brick. Beyond this riveting experience is another attention grabbing contrast; the entrance door to the house. The yellow hued door acts as an ornament to the building since it stands out and adds up to the aesthetics of the house. Since our client is an artist, we took the liberty to play with colour. Our Architecture Firm believes in taking up new challenges and risks. We wish more Architects and Interior Designers in Lahore would take the leap and bring out new bold designs to the market.